Suitability of a region for the viniculture that can be measured by objective criteria. Important criteria are climate and Weather for the prosperity of vines in the course of growth cycle have eminent significance. The exposition (Direction of sunshine) or alignment of the Rows of vines plays an extremely important role, with one hillside with appropriate Tilt the effect is still positively reinforced. In warmer, dry areas are southeast to east slopes, in climatic border areas with heat deficits but sufficient rainfall South to southwest expositions are optimal. The optimum temperature for the growth of the vine is according to research in Geisenheim between 25 and 28 ° C. Towards the end of the Maturity date it should be between 15 and 20 ° C to get an optimal physiological maturity the grapes to reach. Sunny days alternate with cooler nights in terms of balance sugar and acid advantageous. Just before the vintage Heavy precipitation is undesirable because of risk of dilution. However, these criteria alone are not enough to determine the viability of a site beyond doubt. There are locations that are unsuitable for winegrowing despite meeting many conditions. A large part of the most important wine-growing areas lies at an altitude between 300 and 600 meters. However, there are also viticulture at high altitudes that highest vineyards are even over 3,000 meters. The conditions for quality winegrowing exist especially in the vines belts designated geographical areas from 40th to 50th degree of the northern and from 30th to 40th degree of the southern hemisphere. Here are more than 95% of the vineyards. The proximity big waters works especially well danger of frost moderating. 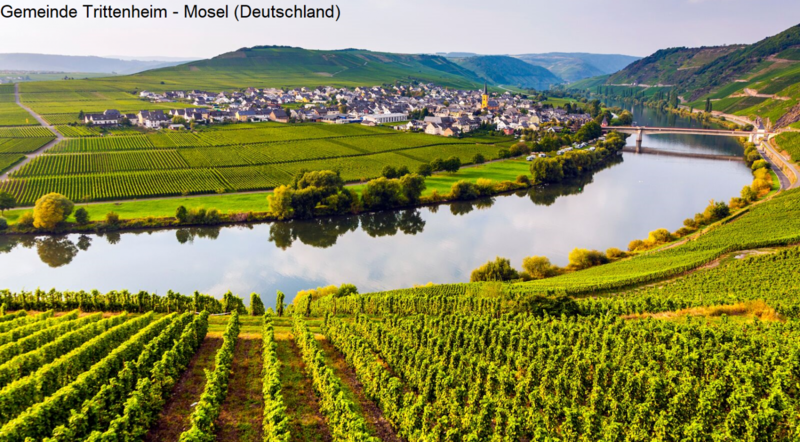 Especially in Europe, many important wine-growing regions are located on rivers, lakes and seas with ideal conditions through the formation of valley slopes. 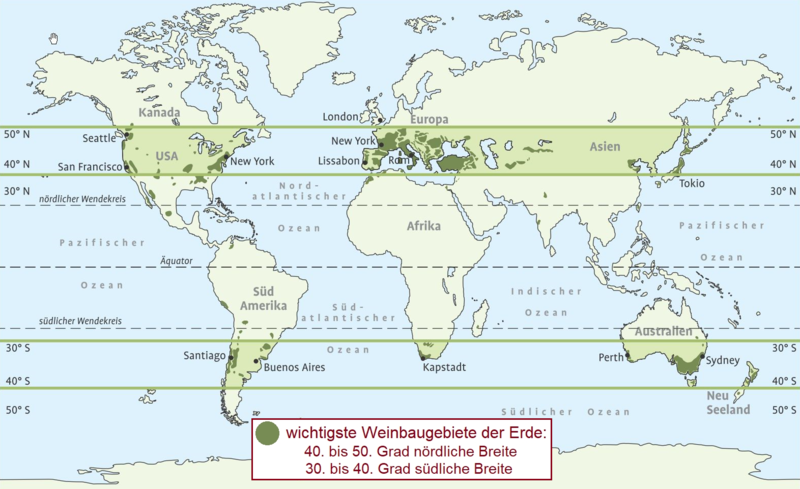 Depending on the climatic conditions, the EU countries will be located in growing zones divided. The term coined in France terroir describes the influence of ancestry The climate and soil interact with the cultivated grape varieties and the local winemaking culture, all of which have an effect on the specific and unmistakable characteristics of the wine grown there. A table of around 100 wine producing countries with vineyards and annual amounts is under Wine production volumes contain. The climate Change In fact, in the next few years / decades, it will bring about significant changes in viticulture. As a consolation: not all will be at a disadvantage - and there are countries that even benefit from it. From the mid-1990s onwards, this concept (also) is the term of Cool Climate Winegrowing which is to be understood as the planting of vines in higher areas with continental climatic conditions. This page was last modified at 17 April 2019 at 10:31.